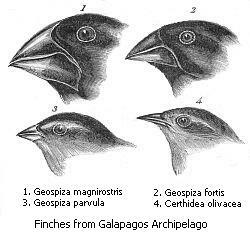 Four of the 13 finch species found on the Galápagos Archipelago, and thought to have evolved by an adaptive radiation that diversified their beak shapes to adapt them to different food sources. Adaptive radiation is an evolutionary pattern whereby a single ancestral form (or species) diversifies (or speciates) into several or many related forms (or species). According to this concept, the different descendant taxa are similar, but each is adapted for a particular environmental niche. It is held that adaptive radiation led to the presence of over 250,000 species of beetles, 14 different species of Darwin's finches on the Galápagos Islands, over 25,000 types of teleost fishes, and different marsupials in Australia (Luria et al. 1981). Adaptive radiation is a subset of the theory of descent with modification, albeit expressing evolution within closely related forms rather than new designs. Unlike Darwinism itself, the concept of adaptive radiation generally does not conflict markedly with most religious views of creation by a Supreme Being. For one, a mechanism or process is not specified as part of the definition of adaptive radiation, merely the pattern is expressed. Secondly, even when natural selection is specified as the main causal agent of the adaptive radiation, most religious adherents do not find problematic natural selection acting within narrowly defined limits, such as making variations within a particular form. Where creation by a Supreme Being and the theory of natural selection conflict is on higher levels, such as origin of new designs, for natural selection is by nature non-progressive, purposeless, and materialistic. The vigorous phase of diversification characteristic of adaptive radiation is held to be especially linked to the evolution of a new design and/or the movement of the ancestral form into a new ecological space. Examples would be movement into an unoccupied territory or the origin of a new mode of life, such as the development of flight by insects more than 300 million years ago (Luria et al. 1981). Isolated ecosystems, such as archipelagos and mountain areas, can be colonized by a species which, upon establishing itself, undergoes rapid divergent evolution. Monotremes and marsupials are considered to be examples of geographic isolation. Monotremes evolved before the evolution of placental mammals, and they are found today only in Australia, which has been isolated from the other continents for 50 million years. Marsupials, which also evolved before the appearance of placental mammals, are also common in Australia. It is held that in Australia, marsupials evolved to fill many ecological niches that placental mammals fill on other continents. Richard Leakey (1994) wrote, "Biologists who have studied the fossil record know that when a new species evolves with a novel adaptation, there is often a burgeoning of descendant species over the next few million years expressing various themes on that initial adaptation—a burgeoning known as adaptive radiation." Adaptive radiation can also occur after mass extinctions. The best example of this is after the Permian-Triassic extinction event, where the fossil records shows that biodiversity increased massively in the Triassic. The end of the Ediacaran and the beginnings of multicellular life lead to adaptive radiations and the genesis of new phyla in the Cambrian period. Darwin's finches—13 species of finches that occupy the two dozen or so islands in the Galápagos Archipelago, are often cited as examples of species arising via adaptive radiation. These finches differ mainly in the size and shape of their beaks, with the beaks adapted to the different food they eat (Wells 2000). Although commonly cited as instrumental in helping Darwin formulate his theory of evolution, Wells (2000) notes that they actually had almost nothing to do with his theory, not being mentioned in the Origin of Species and meriting only a passing reference in Darwin's diary of the Voyage of the Beagle. Darwin did collect 9 of the 13 species (identifying only six of them as species), but failed to correlate beak shape with diet and made no effort to separate them by island. They do not have seemed to have made much of a impression on Darwin as evidence of evolution. Nonetheless, these finches do seem to be a textbook case of natural selection, and Darwin did go back years later and reinterpret them in light of his theory, and thus they are now known as "Darwins' finches." However, according to Sulloway (1982), "Darwin was increasingly given credit after 1947 for finches he never saw and for observations and insights about them he never made." Various field studies on the finches do provide evidence for natural selection working on the microevolutionary level. However, Wells (2000) finds Darwin's finches not to provide very convincing evidence for speciation or adaptive radiation, finding little direct or genetic evidence and noting that the field studies, which originally showed some directional changes in beak depth, exhibited trends in the opposite direction in subsequent studies. He also noted the suggestion of some merging of the species, rather than further diversification. Leakey, R. 1994. The Origin of Humankind. Orion Publishing. ISBN 0297815032. Luria, S. A., S. J. Gould, and S. Singer. 1981. A View of Life. Menlo Park, CA: The Benjamin/Cummings Publishing Company. ISBN 0805366482. Sulloway, F. J. 1982. Darwin and his finches: The evolution of a legend. Journal of the History of Biology 15: 1-53. Wells, J. 2000. Icons of Evolution. Washington, DC: Regnery. ISBN 0895262762. Wilson, E., T. Eisner, W. Briggs, R. Dickerson, R. Metzenberg, R. O'Brien, M. Susman, and W. Boggs. 1973. Life on Earth. Stamford, CN: Sinauer Associates, Inc. This page was last modified on 1 February 2019, at 20:45.